It's that time of year again and we're pleased to release our 'Steaming Around Britain 2017' 4 disc set available in DVD and Blu-Ray formats. Like previous years, we've put together one large collaboration of our work during 2017 featuring both preserved railways and mainline charters from around the UK. Throughout the DVD set a wide collection of preserved railways are featured on the DVD from the narrow to the standard gauge, some of which include the East Lancashire Railway, Ffestiniog and Welsh Highland Railway, Foxfield Railway, North Yorkshire Moors Railway, North Norfolk Railway, Great Central Railway, Severn Valley Railway, Keighley & Worth Valley Railway and many others too. Photo Charters are also included from different railways at different points of the year. 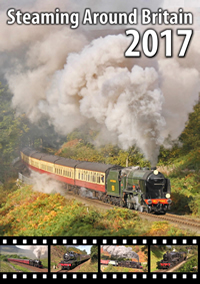 Besides all that, footage is included from a wide collection of mainline charters that have run in the UK during 2016 including 'The Jacobite', 'The Waverley', 'The Scarborough Spa Express', 'The Winter Cumbrian Mountain Express', 'The Cathedrals Express', 'The Dalesman', 'The Fellsman' and many others too. * Price reduction ends on the 4th February 2018.